The first Internet Cat Video Festival grabbed the attention of the world, generating hundreds of articles, interviews and blog posts worldwide. The #catvidfest You Tube playlist has logged a staggering 872,460 views since the festival and “Golden Kitty” winner Henri 2, Paw De Deux (created by Will Braden) has generated nearly 6 million views. On the surface the idea of the Walker Art Center hosting an event for Internet Cat Videos may have seemed surprising, but in the context of Open Field it was a perfect site. The uniting spirit of Open Field or as described by a local writer Maggie Koerth-Baker for the blog BoingBoing as the “Happy Mutant Smorgasbord” is to create a space for new ideas, experimentation and community. The Internet Cat Video Festival was a perfect summation of this desire, taking crowd sourced content and placing it in a new context and bringing together community. Since the festival we have had some time to assess what made it work and where to go next. This was not intended to be a curated film program, but rather an embrace of an internet phenomena and experiment to transform a solitary online viewing experience into a real world social event. The event comes out of our Community Programs and Education Department (ECP) and Open Field, which is built on a platform of crowd sourced content and in the spirit of collaboration and building community. With that said, it was important that event was the Walker Art Center and in the context of a leading contemporary art institution. But it was also about the related programming. We invited local non-profits and animal rescue organizations to have information tents, Lunalux made collaborative letterpress posters, our weekly drawing club convened, Mike Haeg lead the creation of giant cat’s cradles on the hill, Brian Laidlaw and the Family Trade opened the night with Acoustic Campfire (including covers of Cat Power and Cat Stevens) and plenty of food and drink. Its about the entire platform and something that didn’t appear overnight, but the result of years of prior work and experimentation. The festival was created by crowd sourcing videos from the public nominated from You Tube. We received over 10,000 nominations, from which a team of jurors narrowed down the videos to a few hundred. The final editing, sequencing and animations were completed by Katie Hill, Scott Stulen, Andy Underwood-Bultmann and Dante Carlos at the Walker to create a finished reel that was tight and entertaining. It was important for the festival to be sourced from the public, but like Open Field, it benefited from some assistance from the institution in making it finished program successful. One of our lessons from the event, and also from Open Field, is the desire for people to build community and contribute in sincere and meaningful ways. Its also very different watching Keyboard Cat with thousands of other people laughing in unison than alone on your computer. Part of the success of the Internet Cat Video Festival is in this simplicity. It’s not trying to be anything deeper than it is. Although it does raise many issues about authorship and curation and the role of traditional institutions, at its core the event used cat videos as a means to gather people together and create moment of joy. Since the conclusion of the festival we have field dozens of inquires about staging the event at other sites. We wanted the project to remain in the spirit of its origination, but also source from the community of its host site. These events as extensions of the experiment….kinda our mobile Cat Lab. To date we have schedule two experiments to see how the event travels, one on each coast. 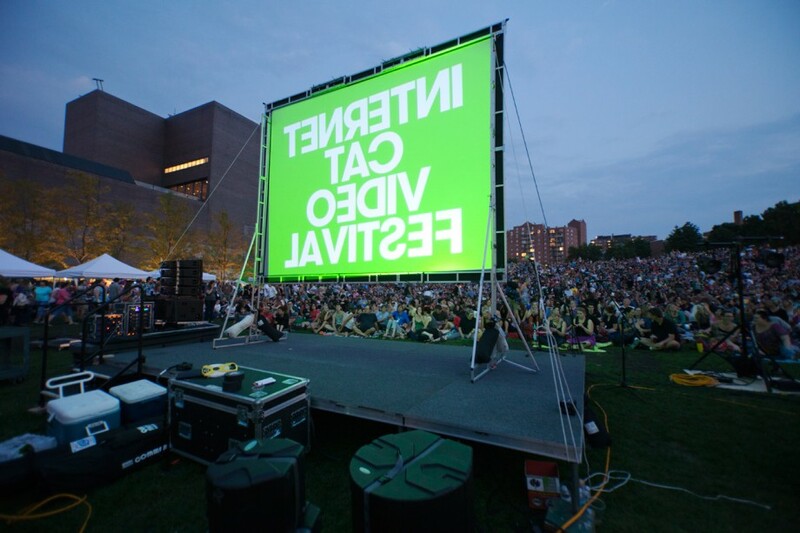 Tonight #catvidfest will make its east coast debut at the U Mass Boston Campus Student Center. Hosted by the student run Harbor Gallery the event will occur outdoors on the UMass Boston campus from 7:00 until 8:30 PM. As seating will be free range, attendees are encouraged to bring their own blankets and folding chairs. This event is free to attend and open to the public. The west coast premiere will take place a few weeks later on Thursday, November 15th at the Museum of Photographic Arts in San Diego as part of their POP Thursdays programming and in conjunction with a crowd sourced exhibition titled Soapbox! The Audience Speaks. MOPA is including the screening as part of an evening of several activities including a DIY blending station with North Park’s Coffee & Tea Collective, Art installation by J Noland and a display of winning photographs from The App Wars, a Hipstamatic vs. Instagram competition. Its promises to be an amazing event! We learned last week that we will be presenting on #catvidfest at this year’s SXSW Interactive Festival in Austin, TX. We will speak on #catvidfest as a case study to question what it means for a museum to reflect contemporary culture in the era of YouTube, explore the challenges traditional institutions face engaging online audiences and share what we learned from transforming a solitary online viewing experience into an real world social event. More on this closer to the event. 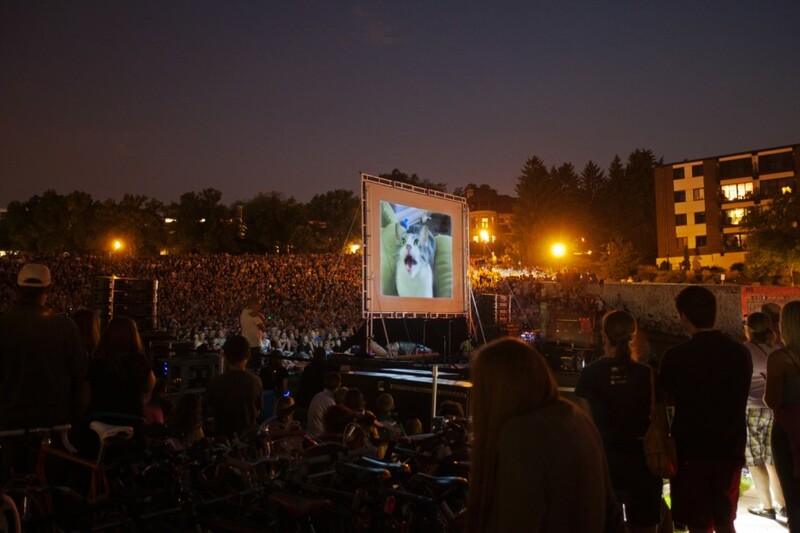 Follow for updates future events and other #catvidfest developments on twitter and facebook.